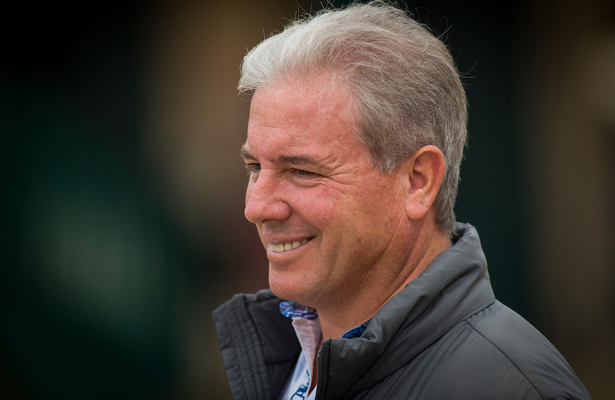 Well-regarded for his success with juveniles, both domestic and abroad, trainer Wesley Ward will be represented by a trio of 2-year-olds as part of Saturday’s Maryland Hall of Fame Day program at Laurel Park. The $100,000 James F. Lewis for 2-year-olds and the $100,000 Smart Halo for 2-year-old fillies, both at six furlongs, are among five stakes worth $500,000 in purses on a 10-race card that begins at noon. Calumet Farm’s Fayette Warrior, fourth in the Futurity Stakes Oct. 7 at Belmont Park, and Ward-owned and trained Hawaiian Noises, a recent maiden winner at Keeneland in his second start, drew Post 2 and 3 in the seven-horse Lewis. Fayette Warrior will be racing for the first time on dirt after three turf starts. He was off the board in his debut Aug. 13 at Saratoga then broke his maiden impressively Sept. 6 at Kentucky Downs prior to the six-furlong Futurity, where he loomed a threat at the top of the stretch before tiring. Jose Ferrer, up for the maiden triumph, gets a return call. Hawaiian Noises was unveiled on the same card as Fayette Warrior but finished well back after pressing the early pace. The son of 2010 Kentucky Derby winner Super Saver returned with a gutsy neck maiden special weight victory going six furlongs on the dirt Oct. 13 under Kent Desormeaux, who launched his Hall of Fame career in Maryland and is named to ride back. Among the challengers are a pair of colts exiting the Maryland Million Nursery Oct. 20, runaway winner Follow the Dog and beaten favorite Scrap Copper. Waldorf Racing Stables’ Follow the Dog hadn’t crossed the wire first through three starts, promoted to his Sept. 14 maiden win via disqualification, but was a no-doubt 3 ¼-length winner of the six-furlong Nursery, his first start with blinkers. Kathleen Willier’s Scrap Copper won at first asking July 22 and came up a nose short in the Laurel Futurity over Laurel’s world-class turf course Sept. 22 in his second career start. In the Nursery, the Great Notion colt stumbled badly at the start and was never a factor finishing seventh. Rounding out the field are Grand River, Passcode, Sovereign Impact and Bustin to Be Loved. In the Smart Halo, Ward entered Breeze Easy’s stakes-winning filly Mae Never No, a bay daughter of No Nay Never, who Ward trained to wins in the Group 2 Norfolk at Royal Ascot in 2013 and the 2014 Woodford (G3) at Keeneland, the same year he ran second in the Breeders’ Cup Turf Sprint (G1). With that in mind, Ward sent Mae Never No to Santa Anita to make her grass debut in the Speakeasy Stakes Oct. 6, where she finished third by a length as the favorite. Her three previous races were all on dirt, including a third in the 5 ½-furlong Tremont Stakes June 8 at Belmont Park and a front-running seven-length romp in an off-the-turf Colleen Stakes Aug. 4 at Monmouth Park. Mae Never No was favored in the Tremont, a race where she took a 2 ½-length lead into the stretch before being passed by Laurel-based winner Our Braintrust, who has not raced since, and subsequent Sanford (G3) winner Sombeyay. Jose Ferrer, up for the Colleen, will ride back from outside Post 7. Also entered are Congrats Gal, third in the Schuylerville (G3) and unbeaten in two starts at Laurel; Helen, third in the Sept. 22 Selima over Laurel’s turf Sept. 22; Our Super Freak, a, winner of two straight including a 6 ¼-length triumph on an off track Oct. 27 at Laurel; Love My Honey, Music of Life and Questionoftheday.